Record and track daily workouts, meals, measurements, medical information, progress photos and more. Stores an unlimited amount of data and supports any diet or workout plan. View and analyze your progress, judge the effectiveness of diets and workouts, and reach your goals sooner. Includes graphs, charts, calendars, statistics and reports. Provides 13 fitness calculators such BMI, BMR, % body fat, target weight, calories burned, splits, one-repetition max weight and more). We use the most accurate, up-to-date formulas available. 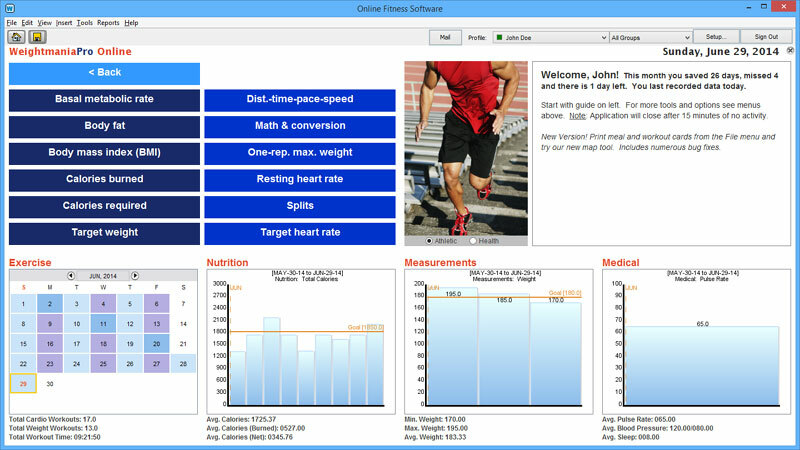 Athlete’s Datasbase is fitness software to track and analyze workouts, nutrition, measurements, health information and progress. It’s one of the most comprehensive fitness apps on the market. Includes 29 tools, 13 calculators, 40,000 foods, maps (to map runs worldwide) and the ability to track up to 120 details per person daily. Supports any type of cardio and weight training, and accommodates any workout or diet plan. Track detailed information about strength and cardio workouts, meals, measurements, weight loss, health (diabetes, cholesterol, sleep and blood pressure) and much more. Map running and cycling routes on or off-road, visualize progress, judge the effectiveness of diets and workouts, and reach goals sooner. For individuals, businesses and groups. Athlete’s Database is used in 56 countries by fitness centers, schools, corporate wellness programs, the military, personal trainers, athletes, coaches and anyone who wants a detailed fitness tracking solution. Businesses can add private labeling and branding (such as logos, custom photos, colors and slogans) and distribute the cloud version to users at no charge. Track one to an unlimited number of people. A cloud and desktop version for Windows and Mac. The cloud version installs like desktop software on any computer, but stores data in the cloud (online) for easy access and sharing. As long as you have Internet, you can reach your data anywhere. The desktop version stores data locally and does not require Internet. Engineering makes a difference. Our products are designed and developed locally (not outsourced) and we continuously update and re-designed them to keep pace with rapidly changing technology, make improvements and support the latest research. For example, the nutrition journal was designed in partnership with the University of Connecticut Human Performance Lab (recognized worldwide for exercise kinesiology and nutrition), while the exercise section is based on input from athlete’s, trainers and coaches nationwide. Based on years of experience. When Athlete’s Database was first released, there were fewer than five commercial fitness apps on the market. It was one of the first to include a large food database, offer a live food search (results are displayed as you type), map runs without GPS and track details like weather, splits and cadence (the number of revolutions of the crankset per minute when cycling). Our entire staff, including the engineering, sales and support team also have strong backgrounds in fitness and athletics. For example, Edward Greenwood, the company president and founder, has 30 years of long-distance running experience (including eight years of varsity track) and 25 years of experience developing software. This is reflected in our products, services and support. Money-back guarantee, free support and free trial. We offer a 30 day money-back guarantee and free, unlimited, U.S. based technical support by email. You can also download a free trial prior to ordering. Our trials install on any computer and do not require an email address, credit card or any personal information. Experience the difference! The most complete training log. Create detailed profiles for each user or client. Profiles make it easy to track and manage groups. They include personal information, a fitness assessment, goals, preferences, groups, detailed notes and more. 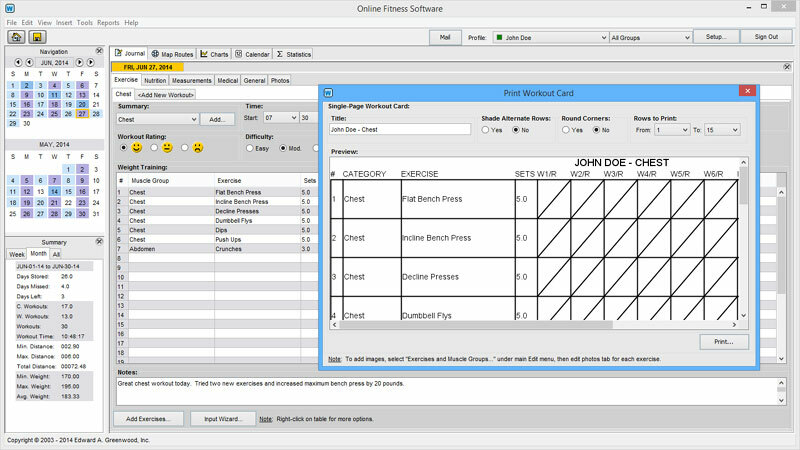 Specify databases that you want to share, such as meal programs, workout programs, custom foods, exercises, routes, etc. You can even add photos of each user. Weightmania will automatically resize and crop them. Store digital photographs and scanned documents (like lab results) for any day. This makes it easy to visualize progress over time. Record diet and weight lifting photos, equipment, route, competition, and race-day photos. 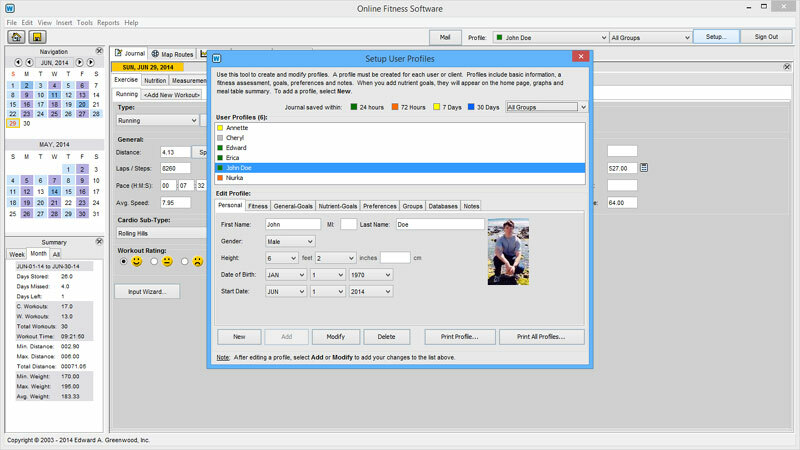 Add text labels, arrange, smoothly rotate, resize and print any image. Supports most popular image formats. 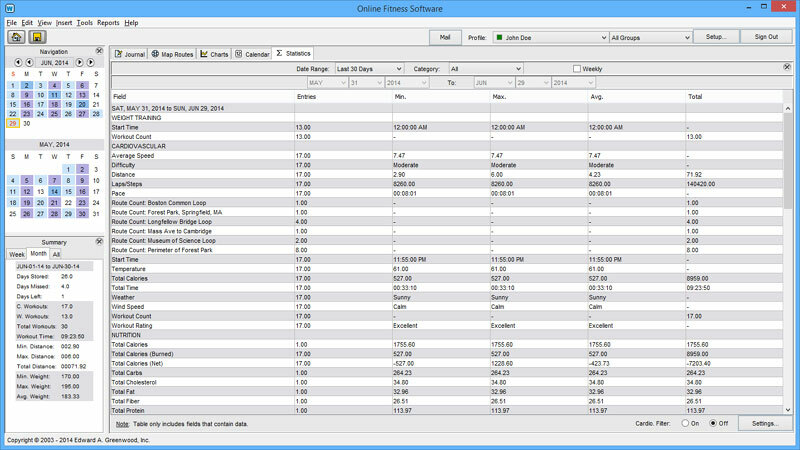 View detailed statistics for any date range. Includes every field in the journal. 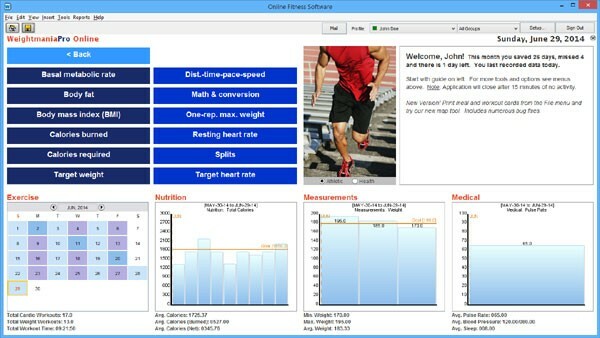 Analyze workouts, nutrition, measurements, equipment use and much more. See daily nutritional intake, the total distance you ran or cycled, the number of times you did a particular route, total mileage on running shoes, average workout times, total weight lifted for each exercise and much more! Select the ‘weekly’ checkbox to see statistics broken down by week. 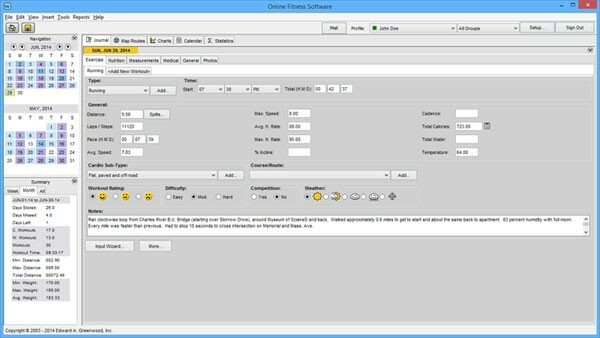 Use the filter option to analyze workouts by type. 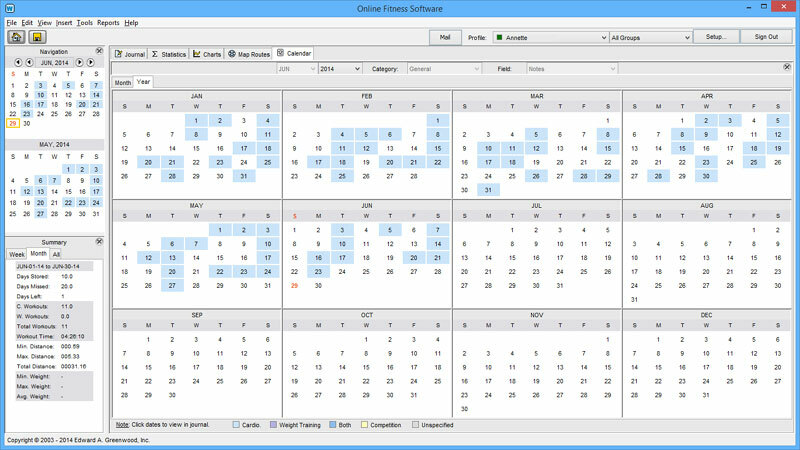 View progress by month on a full-sized color-coded calendar. Use the ‘Month’ tab to view detailed information by month and ‘Year’ tab for a compressed view of an entire year. Visualize days entered, days missed, workouts, meals, measurements and much more. Click on any date to instantly display that day in the journal.l. Track multiple weight training workouts per day. Each workout appears as a separate file tab. Tabs can be cut, copied, pasted and renamed. 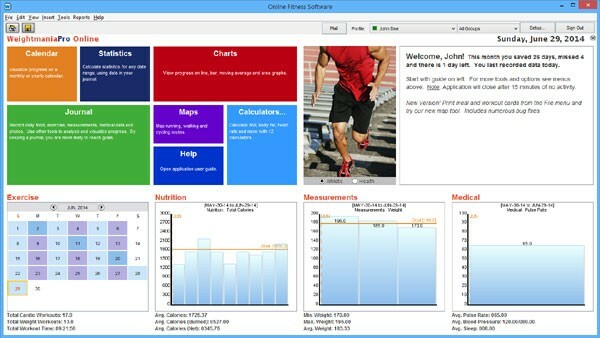 The ‘More…’ button displays additional fields such as calories burned, equipment used and notes. 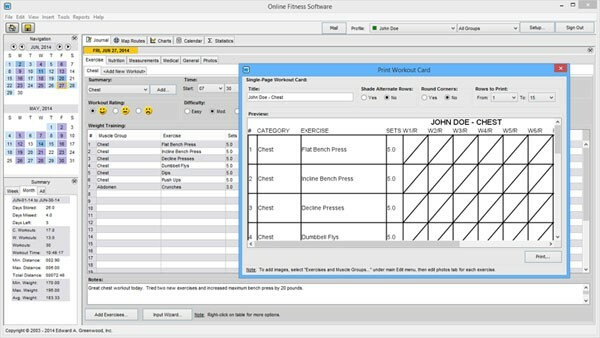 Save time entering workouts with the input wizard or by creating pre-defined workouts. Later, you can insert a table like the one below in a single mouse click! 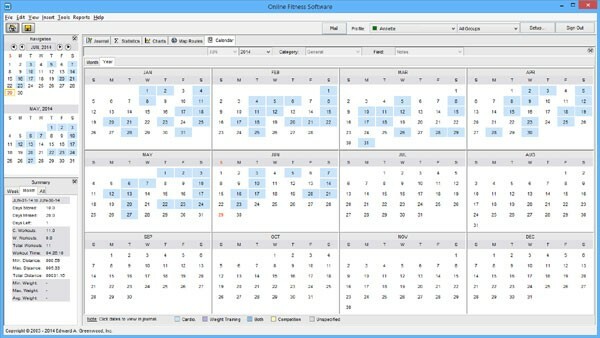 Use the color-coded calendar on the left to visualize workouts entered and workout types. Track multiple cardio workouts per day. Each workout appears as a separate file tab. Tabs can be cut, copied, pasted and renamed. On the screen shown, the ‘Splits…’ button lets you enter and track up to 100 splits per workout. The ‘More…’ button displays additional fields. 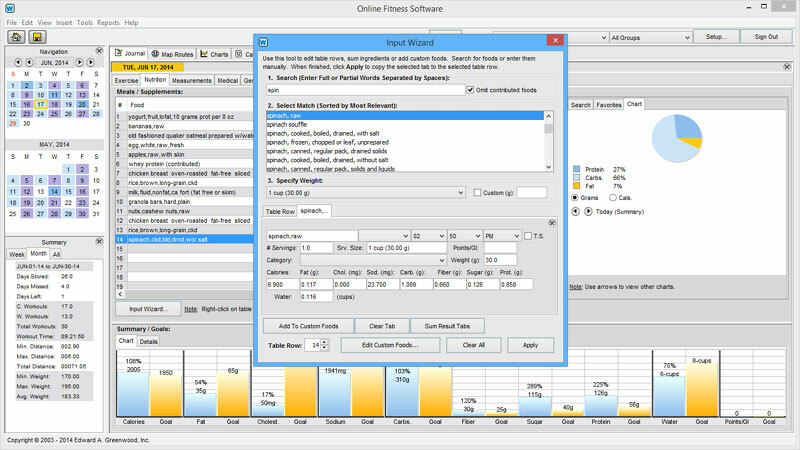 Use the input wizard to enter workouts fast. Includes options to calculate distance, time, pace, speed, splits and calories burned for hundreds of exercises. Use the color-coded calendar on the left to visualize workouts recorded. Use the input wizard to determine the total nutrients in recipes, homemade foods and any list of ingredients. It also makes it easy to edit and add custom foods. Enter up to 100 ingredients at a time. Look up each ingredient, sum the nutrients, then copy the result to the journal. Athlete’s Database will automatically save it as favorite, so in the future, you can just drag and drop this food to your journal. But you can also add it to the main food database as a new custom food. Track exactly what you eat, including total calories, protein, carbohydrates, fat, sugar, sodium, cholesterol and fiber. You can also track water, serving sizes, food groups, glycemic index and points. Use the live, interactive search to find foods in 3-4 key strokes, or drag and drop them from your favorites list. It searches favorites, recipes, custom foods, and a large food database. As food is entered, totals are calculated at the bottom and charts are updated. Blue bars represent totals and orange are goals. Enable automatic time-stamping for serious diet plans. Choose from standard, aerial or hybrid maps. Scrolls fast in any direction. Provides 18 levels of zoom. Adjust route points with drag and drop or move the mouse over any point to see the exact Latitude Longitude. Save and share an unlimited number of routes. Our maps use the latest 2015 images and data. 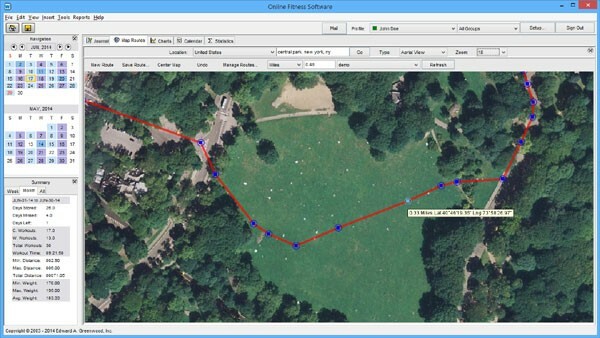 Map your running, walking, cycling and hiking routes without GPS. Draw any route and see exactly how far you went in miles or kilometers. Great for advanced planning. Map routes anywhere — on or off-road, through woods, along walkways, across backyards, and even over buildings (competing products only allow roads). Eliminates the need to wear heavy, expensive wrist and arm bands. Athlete’s Database includes 13 fitness and exercise calculators to help you plan meals and workouts, quickly assess progress, and stay on track. They use the most accurate formulas available. Calculators automatically pre-fill input boxes with information from your profile, so calculations can be done fast. Also, you never need any special equipment other than a scale, tape measure or string. On the start page, you’ll see a 30 summary of your progress and dynamic, color-coded tiles to access popular features. Track up to 120 details about workouts, meals, weight and measurements, diabetes, medical information and more. Record and analyze progress with up to 29 tools. Includes 13 popular exercise and weight loss calculators. 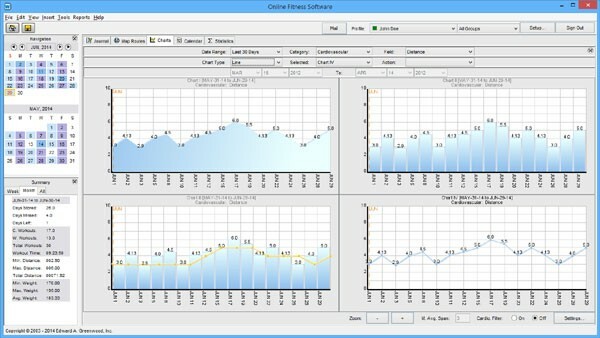 The sample screen shown is comparing four charts at the same time. Over 115 data fields plus hundreds of exercises can be graphed and compared. Use the filter option to chart more specific information. 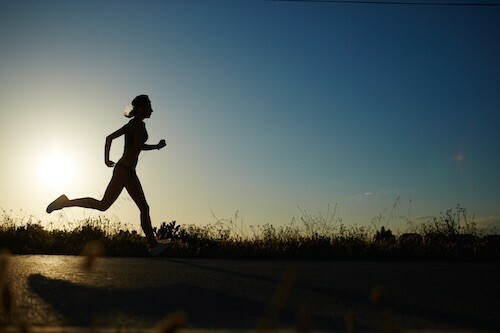 For example, workouts where you ran a specific route, ran less than five miles or kilometers, etc. Quickly and easily isolate factors that affect your progress. 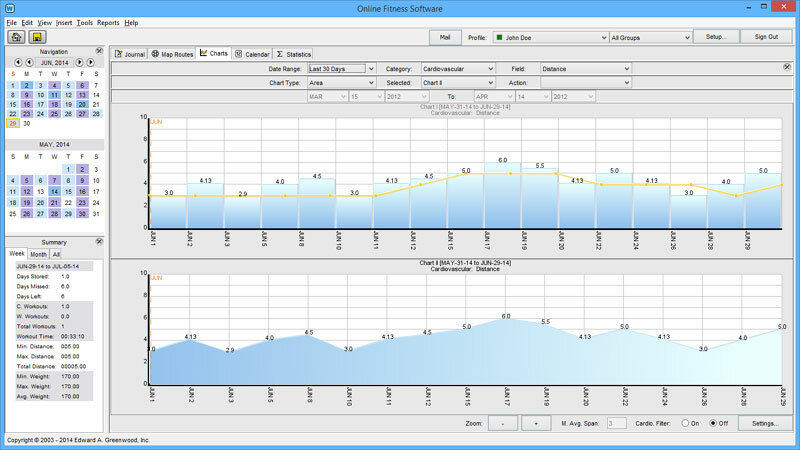 Create detailed graphs in one click. View progress on line, bar, moving average, pie and area charts. 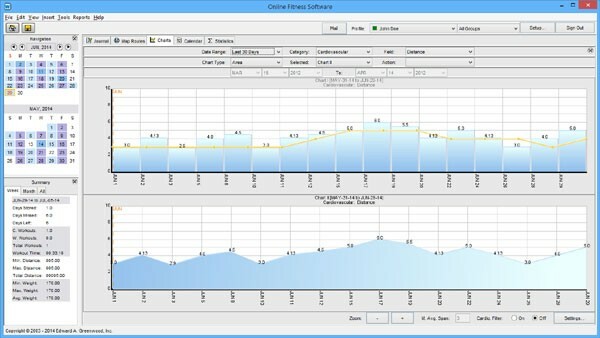 Compare workouts, weight loss, measurements, nutritional intake, sleep, temperature, weather conditions and much more. Each chart can include any date range. A powerful zoom feature makes any chart up to 10 times larger. This makes it easy to analyze data that changes very slowly, such as body weight. Display up to four charts at the same time and analyze almost anything. More tools & features than any competing app. Records daily workouts, meals, measurements, photos, general and medical information. Displays information and progress by month or for an entire year; squares are color-coded by workout/activity type. 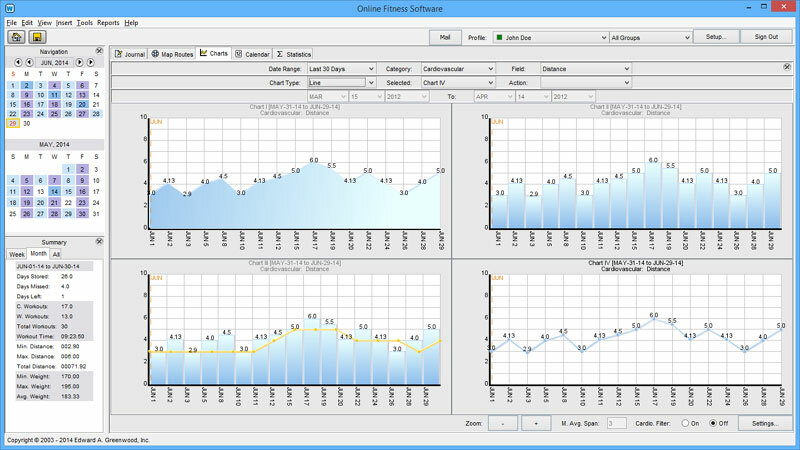 Displays information and progress on up to four charts at the same time; provides five types of graphs, data smoothing and a powerful zoom feature. Displays hundreds of statistics (minimums, maximums, averages, totals and counts) for any date range; provides option to break statistics down by week; business versions calculates group statistics. Creates detailed reports using information recorded in the journal; reports can be generated in text or HTML, then saved or printed. Finds and displays up to 50 nutrients in any food; searches our large food database and lets you analyze detailed macro and micronutrients. Map your running, walking, cycling and hiking routes. 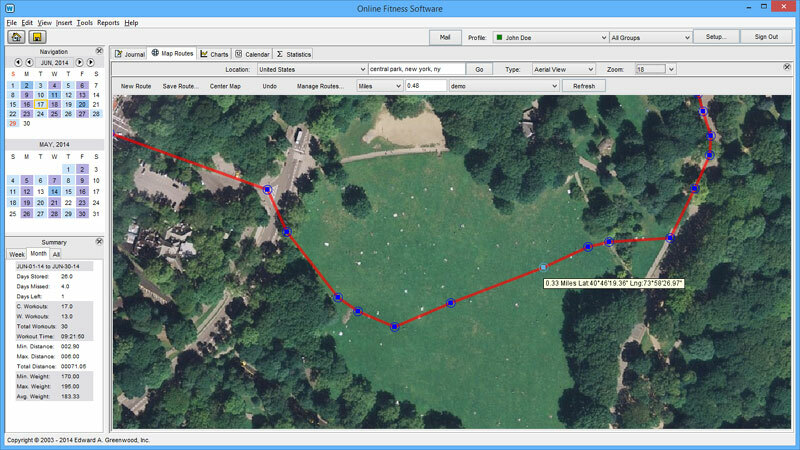 By drawing your route on a standard or aerial photo map, you can see exactly how far you went in miles or kilometers. Map routes anywhere, on or off-road without GPS. Powerful search finds information fast; searches every available field in any date range instantly. For example, find every day in the journal where you ran more than 5 miles, entered specific notes or ate a particular food. Organize and store an unlimited number of recipes. Store recipes, directions, preparation time, total time, number of servings, a one to five star rating, detailed nutrition information and digital photos. Arrange, label, rotate, resize and print any image. Cut, copy and paste a single recipe or an entire collection. Easily share recipes with other people. Includes 30 predefined categories. Create and store a detailed grocery shopping list. Recorddescription, quantity and price for each item. Automatically calculates the total cost. Helps you eat better and save time at the supermarket. Print details for one item or a complete shopping list you can take to the store. Includes eight predefined categories, including a folder for coupons. Manage your favorite fitness and health related web links. Stores the name of each link, a detailed description and its URL. Display any web page, video or online document in one click. 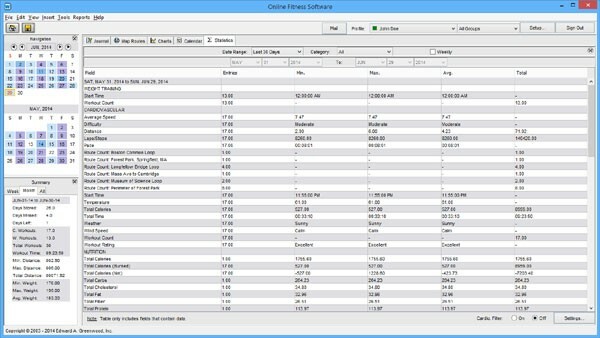 Keeps all your fitness links in one place and stores more detail than most web browsers. Easily share links with other people. Track and organize your training equipment. Know when it’s time to replace running shoes, bicycle tires and clothing. Stores the name of each item, initial use date, a detailed description and photos. By tracking equipment used in each workout, the statistics tool will calculate minimum, maximum, average, number of uses, total use-time and total distance for any date range. Great for tracking mileage on running shoes. 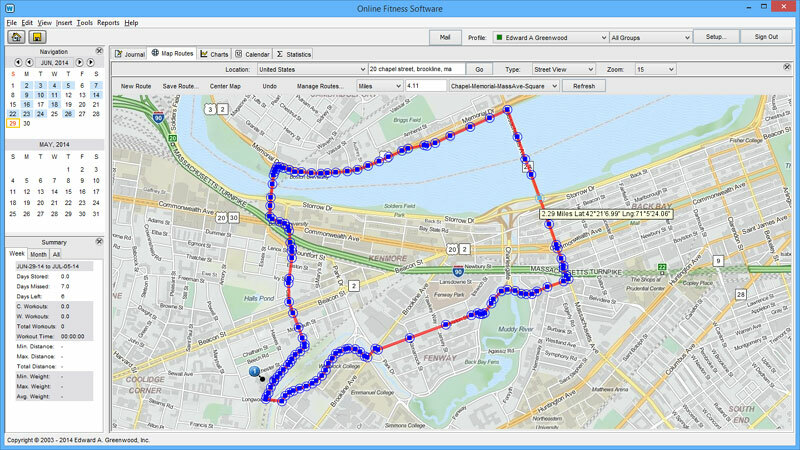 Organize your running, cycling and walking routes. Stores the name of each course or route, distance, a detailed description, digital photos and maps. 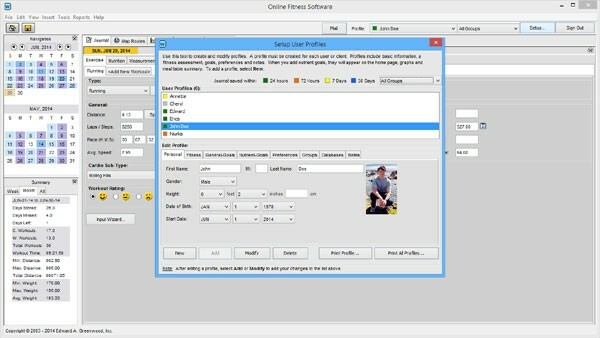 Arrange, label, rotate, resize and print any image. Anytime you record a cardio workout, select the route name from a list to automatically fill in fields and save time. Calculates % body fat, automatically interprets the result and tells how you rate. Includes one calculator that requires no special tools (only a simple tape measure) and a second for calipers. Uses Jackson-Pollock and Siri equations plus formulas developed by the U.S. Navy, U.S. Air Force and American Council on Exercise. Calculates body mass index (a widely accepted measurement of weight status). Automatically interprets the result and tells how you rate. Calculates basal metabolic rate (the number of calories your body burns while at rest). Calculates calories burned for hundreds of different activities, for any amount of time and body weight. Calculates the number of calories you need daily, based on your age, weight, gender and activity level. Calculates the range your heart rate should be in during cardio. workouts for maximum safety and benefits. Calculates distance, time, pace and speed after cardiovascular workouts; can also be used for planning and estimating workouts. Calculates splits for any distance or interval; ideal for race planning or anytime you want to maintain an even pace during training. 42-key calculator for basic and advanced calculations; performs a wide range of conversions between metric and English. Helps you calculate resting heart rate. Heart rate can be used to evaluate your health and fitness level. Includes a large, scientifically accurate 2 minute, 1-minute, 30-second and 15-second count-down timer. Makes it easy to regularly check heart rate at home. Calculates your one-repetition maximum weight (“one rep-max”), and 20 percentages of that weight, for any weight training exercise. This is widely used to measure overall strength and determine how much weight to use in many weight training programs. Calculates the number of calories you need to consume or burn daily to reach a weight goal by a specific date. Helps you lose or gain weight. Just enter a weight and select a target date (it will also suggest a safe date). For increased accuracy, calculations are based on BMR (Basal Metabolic Rate). This is calculated automatically using your age, gender, current weight and activity level. Trusted by athletes, coaches & trainers worldwide. We want to hear from you! Use the form below to contact us for any reason.